Redemption arrived for Melody Belle and Troy Harris at Te Rapa when they combined in a nail-biting victory in the Gr. 1 BCD Sprint. For Melody Belle it was a turnaround from her dismal performance in the Telegraph at Trentham as she took her Group One tally to four. For Harris redemption was far more graphic, having ridden his last Group One winner more than 10 years ago. In the interim he had been through the challenges of increasing weight, riding over fences at one point and not at all at times, but new-found maturity that includes fatherhood have brought out the best in the 30-year-old talent. “It was my weight mainly, that’s what was holding me back,” said Harris as he cradled his 15-month-old son Cooper following the post-race formalities of today’s weight-for age sprint. “This is great though, to wear the same Te Akau Fortuna colours as Tell A Tale when I got up and beat Dad (Noel) in the (2008) 2000 Guineas. “I knew this mare was a good ride but to be fair she never gave me a great feel in the run. The others around me were going better and I had a few lengths to make up as we headed down the straight. At the line Melody Belle had a head to spare over Bostonian, hailed the winner when he burst to the front midway through the run home, with a nose to Ardrossan who lodged his bid and fought like a tiger all the way to the line. Volpe Veloce headed the remainder a length and three-quarters back, followed in by Melbourne mare True Excelsior. The result was another milestone for trainer Jamie Richards, not yet 30 and a licensed trainer for less than four years but now with an incredible 50 black-type wins to his name. Harris rode today on a stay of proceedings after appealing a careless riding suspension and came away with not just his win on Melody Belle but also the Gr. 2 Waikato Guineas on the Richardson/Parker-trained Sponge Bob. 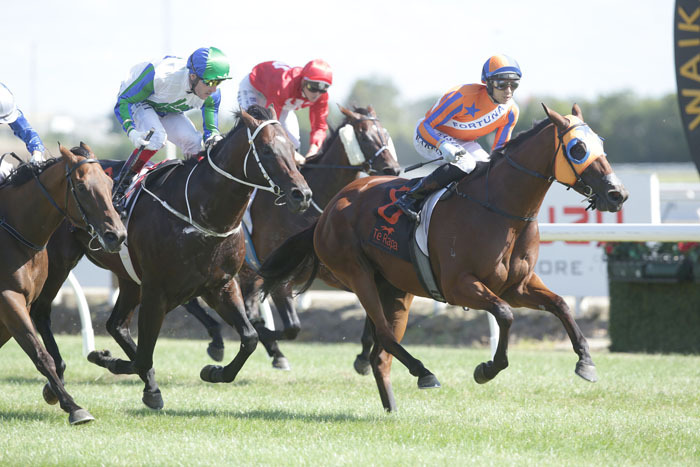 Melody Belle’s win completed a feature race clean sweep for Matamata-trained horses. That included the Gr. 1 Herbie Dyke Stakes quinella to the Moroney/Gerard-trained On The Rocks and Sponge Bob’s stablemate Tiptronic, a Waikato Guineas quinella completed by On The Rocks’ stablemate Arrogant, and the Gr. 2 Sir Tristram Fillies’ Classic win to the Wayne Hillis-trained Imelda Mary.